Back of the Head: Smallville 9x13 - "Warrior"
SUPERMAN! CHLOE SULLIVAN! LOIS LANE! TESS MERCER! (Nope, not this week) ZOD! (Him neither. Off building his solar tower, I guess.) THE GREEN ARROW! Crazy fun follow up to Absolute Justice. In some ways (Zatanna, Clark and Zatanna, Lois and Clark, Chloe and Oliver, Zatanna), I liked "Warrior" even better. Allison Mack's second directorial effort is a triumph. 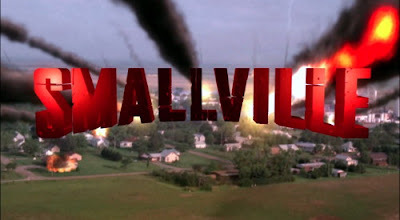 Smallville did their version of SHAZAM, having a young boy find a comic book at Wonder Con that was enchanted by a 20 year old John Zatara during his "gone rogue" period, and transforming into a full grown adult superhero, Warrior Angel, with all of Clark's powers, plus flight. Then a rub of warping the Captain Marvel stand-in that might make Alan Moore proud: if the boy feels betrayed, Warrior Angel turns evil and becomes Devilicus. *Lois wears a Storm Trooper costume, and then trades it in to wear a mock Wonder Woman costume. *We get to see Clark fight crime while on the phone, including pelting a bad guy with a thrown can, while casually talking to Lois. *In a weird Meta moment, Clark arrives at Wonder Con dressed in his mild-mannered reporter shirt and tie and immediately bumps into a guy dressed exactly like season 1-6 Clark: primary red jacket, primary blue shirt. *Chloe tries to get Warrior Angel to explain his origin and drops that in Smallville, a Metahuman is someone born with powers (not a mutant). Someone who gets their powers from Kryptonite is still a "Meteor freak". *Zatanna is hot for Clark and uses magic to temporarily seduce him, but he resists because he really loves Lois. Serinda Swan as Zatanna is better, funnier, and sexier here than she was in her debut in "Hex" (which The CW repeated after "Warrior"). She even looked hotter in street clothes than she did in the fishnets and top hat. 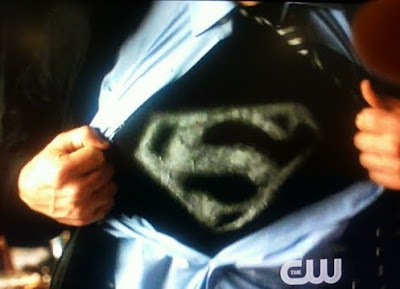 *When Warrior Angel transforms into Devilicus and Clark goes off to save Chloe, for the first time in the 9 year run of Smallville, Clark tears open his shirt and exposes the "S" shield! We waited nine years to see that. Smallville has always been about withholding Superman from the audience. Every single classic Superman bit they drop causes Super-salivation. *All of Clark's verbalizing about the nature of (super)heroism; the more he articulates his beliefs the more he sounds like Superman. *Clark confessing his makeout session with Zatanna to Lois; Lois quickly snogging a Daily Planet employee walking by as revenge. Clark's "I'm gonna finish my apology now!" Smallville's take on Lois and Clark is so far beyond the previous Lois and Clark series. By this point the chemistry between Tom Welling and Erica Durance has surpassed Christopher Reeve and Margot Kidder's banter. annataZ sdeen ot eb edam otni a seires raluger!